It takes guts to grow premium wine grapes—plus a sizable amount of cash, a love of farming, and the fortitude to deal with the ongoing challenges, both environmental and political, of producing a great glass of wine. Frost may not be the biggest of a grower’s concerns, but it has become a vexing problem here in California’s Russian River Valley, where the rights of farmers sometimes go head to head with the rights of fish. When the weather dips below freezing, as it did numerous times here last month, the vulnerable, newly formed grape buds can be damaged or killed, and part or even an entire year’s crop can be lost. So on freezing nights in spring, many growers spray water overhead to prevent the damage. The water freezes, encapsulating the buds in ice and forming a protective layer that insulates from even colder temperatures. 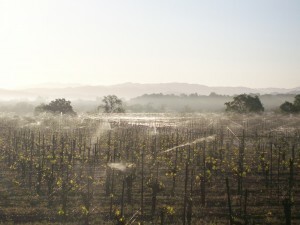 My neighbor’s vineyard pictured here is being protected early morning of March 11, 2010. The process takes a lot of water, which is pulled from the Russian River watershed and its aquifers. Technically speaking, grape growers are farmers. But not all farmers are created equal in the eyes of California’s agriculture commission. Since grape crops become wine and not food, a grape grower’s water needs rank lower than the needs of others, including fish. Last spring, we experienced unusually cold overnight temperatures, with morning temperatures dipping below freezing. Federal officials assert that in both 2008 and 2009, frost protection practices drained the rivers, stranding and killing both the endangered Coho salmon and Steelhead trout, both members of the salmonid fish family. The National Marines Fisheries Service assert that two fish kills on the Russian River and its tributaries were caused by rapid drops of water being pumped out for frost protection. 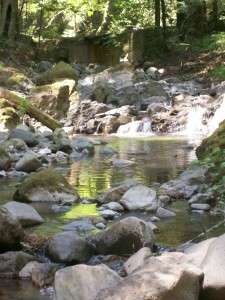 One of the kills, in the beautiful Felta Creek, (right) involved Coho salmon, and the other involved Chinook salmon, listed as threatened. The results of the investigations into these kills have not yet been announced. But since the Endangered Species Act prohibits human activity that results in the death of protected fish, the National Marine Fisheries Services has requested that the California State Resources Control Board put a ban on all diversions from the Russian River watershed for vineyard frost protection. 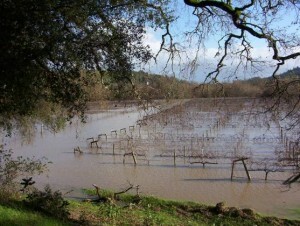 This is the end of business as usual for grape growers. The state water board has formed a special Russian River Frost Protection working group to explore the issues, with opportunities for public comment. California has also been pledged $260 million in federal stimulus money to help address water shortages and aging infrastructure. Meanwhile, grape growers have been working with the state, hoping for solutions through self-regulation. Over the last year, I’ve discussed this hot topic with several winemakers and growers in Healdsburg. Ted Elliott, a seasoned producer of stunning Russian River Valley Pinot Noir, believes growers could use treated wastewater for frost protection, provided adequate storage could be found. Many farmers resist using treated wastewater for irrigation (the greatest watering need arises later in the season, when summer temperatures are high). 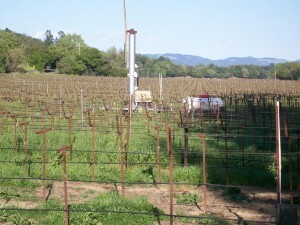 Gerry Pasterick of Pasterick Vineyards favors the notion of using reverse osmosis to purify wastewater to a satisfactory standard for both frost protection and irrigation. He notes that this system has been successfully used in Orange County. Others suggest using giant wind fans for frost protection. It’s an old-school idea, but still effective; I spotted this wind fan (pictured) with its propane tank at Twin Valley Ranch, a Gallo property. This system will be moved after the threat of frost so it won’t get flooded out during heavy winter rains (see the flooded picture of the same location). Personally, I favor a system from SIS Frost Protection, called simply the SIS System, This mechanical device operates under conditions of radiational cooling, selectively draining colder air and ejecting it upward in a vertical jet away from crops. It’s being used successfully worldwide for these applications. The next time you sit down with family and friends and raise a glass of Russian River wine, spend a few moments contemplating these issues. I believe we all need to step up to find and use innovative solutions. Balance makes a great wine—and also great politics. 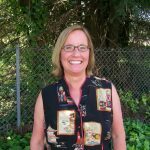 Nancy Citro is on staff at The Wine Shop in downtown Healdsburg and has lived in the beautiful Russian River Valley for nearly three decades. 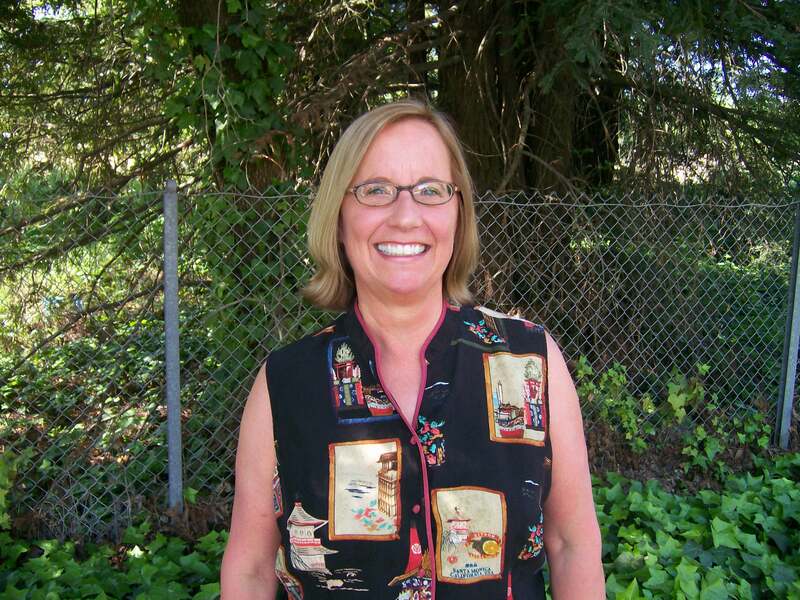 She farms a small zinfandel vineyard & has enjoyed fly fishing Northern California Rivers & streams since the sixties. She welcomes your thoughts & suggestions at healdsburggal@sonic.net. Good post, i like fresh spring water, the colder the better. Bloggers are actually under appreciated, many thanks for bothering to post this.